Shirdi Sai Baba Stories,Leelas and Teachings. : Shirdi Sai Baba's Grace-Experience Of Sai Devotees-Part 30. Shirdi Sai Baba's Grace-Experience Of Sai Devotees-Part 30. Sai Baba is Lord of Kindness and Love.He is always full of mercy. 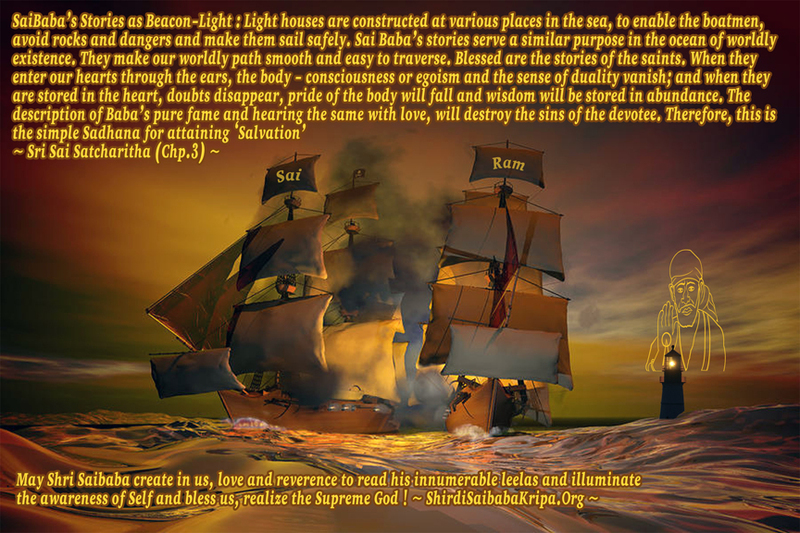 What is wanted on our part is whole-hearted devotion to Him.Whenever, a devotee had complete and whole-hearted devotion to Sai Baba, all his calamities and dangers were warded off and his welfare attended to by Baba.Attached below are few Sai experiences by devotees sharing the same thought . Jai Sai Ram . Best wishes for your consistent seva to help devotees around the globe. Please share this wonderful leela of Baba. There are many core issues like job, health, debts, marriage to be attended to by Baba in every devotee's life and HIS blessings in it may get delayed due to karma. Inspite of these delays, there are other daily dealings that end up in one or other problem, where relief and respite is sought from Baba. It is undeniable truth that BABA gives relief in many things irrespective of its importance in day-to-day life to our sincere prayers. When i handedover my situation to Baba and moved on, HE blessed me with HIS care and support undoubtedly. I bought a small Silver plate worth Rs.3,850/- designed with ornamental stones to use in pooja for my sister. But she found it inconvenient to use. I felt bad about my carelessness and after a month's time, I decided to return it with a preparedness to lose thousands in exchange. I contacted the sales person over phone and discussed about the fate of the transaction in exchange for any other item. The manager confirmed me that they could worth it for Rs.800 or at the most Rs.900/- and asked me to come with the bill. Here I need to say, every year beginning, as a ''thanking gesture'' to Saibaba for helping me and my family in many frivolous issues, I use to do Anna Dhaan for many and also give a gift to Baba, some Silver Item in a Mandir. I told Baba, this year I wish to buy a Silver Anklet for you but let me use this exchange deal for it. I prayed to baba to take His item with best offer price and whatever loss Baba gives, I shall abide by it. Praying thus, I took the bill and the item to the shop. The manager checked the bill for proof and the item to be returned. I requested him to give the best exchange price. He then enquired me about my new purchase this time. I told my wish of offering a Silver Anklet for Shirdi Saibaba. Without even a thought, he simply took the bill and scribbled the price deduction with a sign in it and handedover the bill. I was astonished at Baba's leela. The manager deducted only the Vat charges of just Rs.38/- and asked me to choose items for Rs.3,812/- and I was also offered cool drink. The manager revealed himself too, a devotee of Shirdi Saibaba and moved away to see the next customer. Literally I was in tears to realize this big help of Baba pulling me out of a deal in losing more thousands. I was much happy and satisfied at Baba taking this year's gift from me as a Saviour. Please post this picture, idol of lord balaji, behind the lord, Baba's gold plated photo conveying HIS presence to take care of his children. Glory be to Sri Saibaba, I would like to quote the instance in Sai Satcharitra, Chapter 25, how Baba prevented the loss from Cotton trading and grain dealing for his devotee Damu Anna Kasar of Ahmednagar. 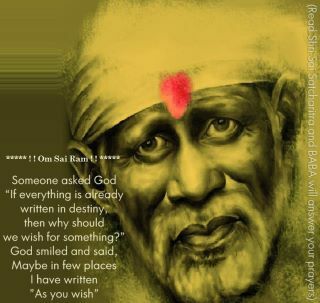 Vow to Sai, Bliss be to all. Bow to Sai, Peace be to all. Om Sai, Sri Sai, Jai Jai Sai. How are you and all your family members? My heartful thanks for your services and am praying our Almighty Sai to help you to continue your services with out any hindrances. Our family is a group family which includes my own family members,my mother's sibling's family.Though we all are living separately we all are bonded with enormous love and affection.My uncle(mother's younger brother) is living next to our street in which we are living. Twenty days back my uncle called our home at night and told that his wife had got sudden fix problem.we all are worried and surprised since my aunt is perfectly well and didnt got fix before that.The next day my uncle consult a neuro specialist and the doctor advised to take a MRI scan.In our family we are having practice that if we are going to do any health test then we ll drink Sai's udi with water before the test. My uncle is not a Sai devotee.So I thought if aunt come to our house before MRI scan we would have given Udi with water to her.But now since she directly went to hospital I prayed Sai that there shouldnt be any health issues.Here only our Sai started playing his miracle.Due to some reason they post ponned the scan in the evening and my aunt directly come to my house from hospital.Before going to take scan I prayed sai wholeheartedly and gave UDI with water to her. My uncle told that we would get the result the next day.I had strong faith that there wont be any problem to my aunt.But unexpectly the doctor told my aunt is having very big tumour in the brain.He also gave the surgery date.The doctor added that after surgery the tumour should be tested (biopsy test) that is whether it is cancer or normal tumour.The doctor also told that they cant tell anything now unless they open and see the tumour.My aunt is having one daughter.So we all are very much worried.The surgery date was Jan21st(Saturday) and the doctor told that she could admitted the previous day Jan20th.Since my aunt got vomitting sensation at Wednesday night she got admitted on Thursday itself(Baba day).I told my aunt not to worry ,since Baba itself will do the surgery.She also drink Udi with water in empty stomach daily until Jan 21st. We are continuouly praying sai and reading Sai Satcharita during the surgery.My another aunt went and did archana in sai's temple on my aunt's name and she also told the health issue of my aunt.After doing archana the priest told her not to worry and only money would get wasted,nothing will happen to the patient.The surgery went for 4 hours. The doctor told that nothing serious and they send the tumour for biopsy test.We all pray for the test should be normal.Sai had done that and the test is normal as we prayed.Our tonnes of thanks to Sai our Thanvanthry.My aunt return home the next thursday.Sai had given back my aunt to us.Even though tumour came bacause of bad karma Sai washed her Karma and saved my aunt. Babas Blessings: For PhD funding to pursue further studies. 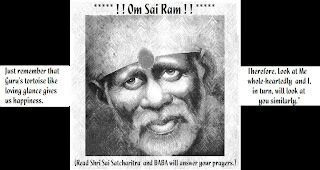 I have been thinking to share my experience of Sai Baba's Blessings and gracious big heart. He helps all who comes to HIM and blesses them with HIS kindness and Love. I did my Masters in University of UK and wanted to study further to do a PHD but it was too costly and I wanted funding for the same. I did not find anything suitable for 2 years and I had started work already in UK. Here also GOD has been kind with me where people are struggling for JOBS. I got it and that too a good one, a job I wanted and related to my field. However I was not very happy as I had not got PhD funding. Than I started praying to Sai Baba, did HIS 9 Vrat .That gave me an oppurtunity in fact two, which encouraged me (BY BABAS BLESSINGS) to ask my company to sponsor me, and with BABA's kindness, I got a yes from my company for the same. It was a sheer miracle. My husband also prayed to SAI Baba for those 9 Thursdays. He was not happy with his job, and BABA blessed him with a better job in our same company. HE is Happy now. His faith increased many fold and believes a lot in BABA. SAi BAba is the greatest Lord and very Kind God. Followers of SAI, Please please please, keep faith in BABA and keep patience. He helps all who come to HIM with their worries and problems, whether big or small. He cares for HIS followers and all LIVING THINGS . Please Please Please do not leave FAITH on HIM. I would like to thank all devotees who shared their stories above. It help strengthen our faith in our Baba. I am sure Baba is everywhere. Bless the author for this great deed. This is truly amazing.I was thinking of my Phd and Baba give'sme an answer for my query through this experience. What can i ask baba .Now i am confident that I can also get Phd soon.Baba I will not loose my faith and wait for your blessing .Baba bless each one of us . In the same way you are Maintaining BLOGS(sister BLOG IN TELUGU).yOU ARE ONE OF THE sparrow,which is mentioned in SAI SATCHARITA. SHRI SAI BABA.MAY BABA BLESS YOU AND YOUR SERVICE! Manisha ji every thursday I am waiting for this article. It gives me so much strength the wallpaper or picture that you put go so right with devotees story.today i was very sad but when i read the messg in picture it appeared to me that Baba is only speaking to me .my mind became fresh and had good feeling for life and doing something.Saibaba know are mind and give us right message to make it happy.thank u for doing this service.I am happy i know this website . What a miracle of baba .The devotee thought good things for Baba and he blessed by giving the same amout back.Who can do this ,even our near one's cannot know our thought but our baba knows. I am so happy to hear that Baba got good anklet from devotee .Sai deva Thandri deva .You are such a loving god in this earth .ANANT KOTI BRAHMAND NAYAK SADGURU SAI KI JAI. Baba please help me .I am in very bad situation.Life is not good any more,even fridns dont come and talk with me. I feel neglected and lonely.You are my only support and hope baba .Can you please help me Baba andmake my situation good by your blessing .Baba please please help Baba I am very sad due to the things in my life. everything is getting away from me baba come and save me baba .please pray for me devotees . OUR BABA IS REALLY THE GREATEST AMONG THE GREATS. ALL SAI DEVOTEES BELONG TO ONE FAMILY 'BABA'S FAMILY'. BABA TAKES EVERY CARE OF HIS FAMILY MEMBERS. THEN WHY SHOULD WE FEAR? BABA IS THE SOURCE OF 'ALL' WHAT WE NEED OR WHAT WE SHALL NEED FOR US OR FOR OTHERS. HE ONLY KNOWS WHAT WE NEED AND SURLY FULFILL THE NEED EVEN IN LATE. BUT THE LATE IS NOT AN IMPORTANT FACTOR. THE LATE MAY BE FOR ANY REASONS WE MAYN'T KNOW BUT BABA KNOWS. THIS 'LATE' WILL NOT HARM HIS BELIEVER RATHER WILL HELP ONE TO ATTAIN MULTIPLE BENEFITS OF ONE'S NEEDS (WISH AND WILLS). SO WE SHOULD FIRMLY ATTACH THE "FIRM BELIEVE ON BABA" TILL THE END. WE MUST SURE THAT HE NEVER SHALL MAKE HIS DEVOTEES HOPELESS. OMM SAI RAM.